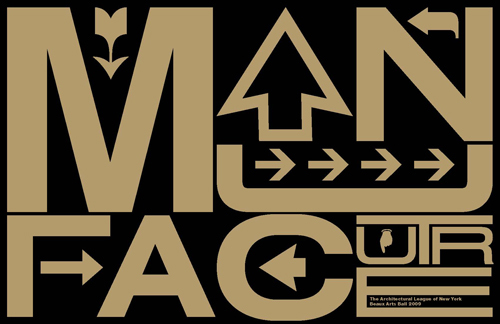 iPad 2 Giveaway: And The Winner Is…. We're back from NeoCon in Chicago, where we had a fantastic showroom crawl with designers passing through Hafele, The Fine Line, and Toto. People had drinks, took in the fantastic products, and stretched their legs after a long day at the Merchandise Mart. Now that we're back at the office, we drew a card for the winner of an iPad 2. And the winner is... Lynn Boutross, ASID, of Blutter/Shiff Design Associates! 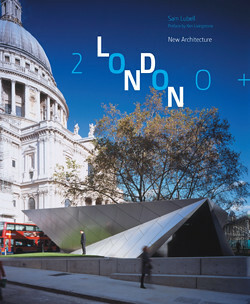 Congratulations from everyone at The Architect's Newspaper! Monday night the Storefront for Art and Architecture threw a benefit party at the new home of the Paul Taylor Dance Company on the lower Lower East Side. 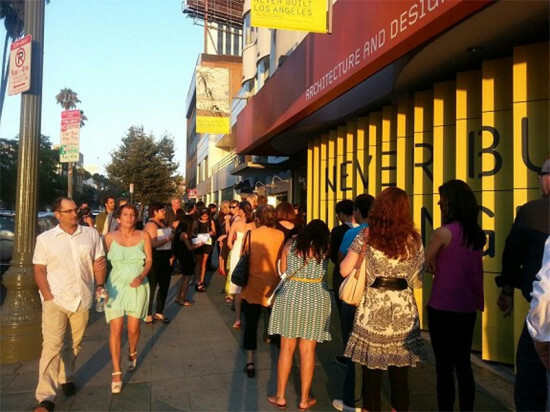 Arguably the city's most experimental architecture venue, Storefront can count some of the city's major architecture names as supporters, or at least as party goers, including Steven Holl, Brad Cloepfil, Marion Weiss and Michael Manfredi, and Bjarke Ingels. Younger designers like Florian Idenburg and Jing Liu of SO-IL, and John Hartmann of Freecell were also in attendence. 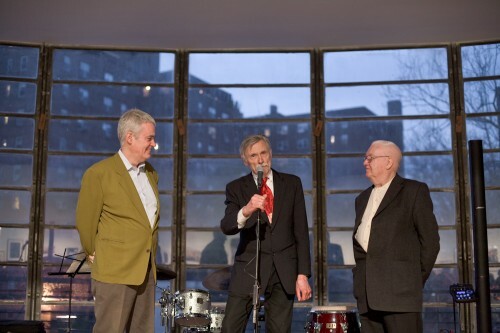 AN Editor-in-Chief and Storefront board member William Menking and fellow Archigrammer Dennis Crompton honored Michael Webb, Storefront board member Belmont Freeman cut a rug, and Charles Renfro urged on bidders in the silent auction, which includes works by artists, designers, and photographers ranging from John Baldessari to Iwan Baan. Even with all the people watching, dancing, drinking, and snacking, one person stood out: Storefront's dynamo director Eva Franch Gilabert, ablaze in a fuschia mermaid dress. Has the architect's black uniform finally been banished? 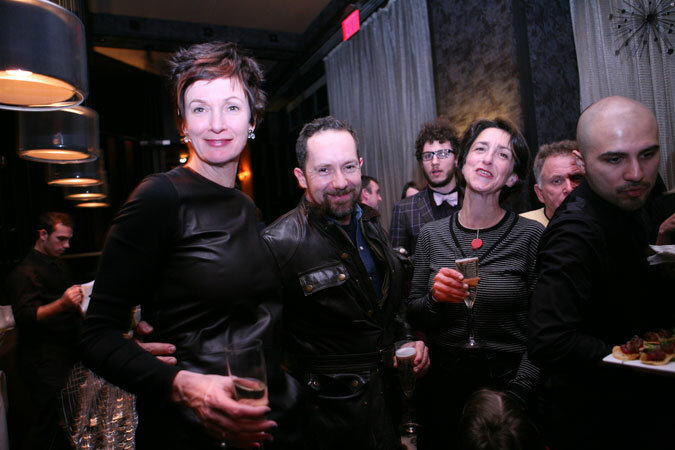 Architects, designers, and a few sharp Irish guys who knew someone at the door converged on the Tribeca Grand Hotel last Wednesday night when Winka Dubbeldam of Archi-Tectonics and Cinzia Fama-Agnolucci of CFA Design threw a bash in The Salon. The Archi-Tectonics-designed space, provided a sultry backdrop to this family affair. Fama-Agnolucci’s mother kept watch from a low perch at the entrance as someone’s toddler made a beeline for Dubbeldam’s dog, who promptly snubbed her, preferring the company of a low-lying plate of hors d'oeuvres. 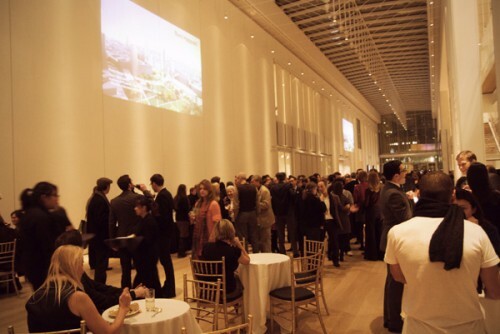 On November 17, The Architect's Newspaper and Buro Happold, along with our other event partners Dow Building Solutions, Graphisoft, American Hydrotech, and Adaptive Building Initiative, celebrated GreenBuild at the Art Institute of Chicago's Modern Wing. Renzo Piano's LEED certified building proved to be a stylish venue for the hundreds of architects, engineers, designers, and other assorted revelers. Click through for pictures of some of the evening's hundreds of party-goers. It was quite the green scene! 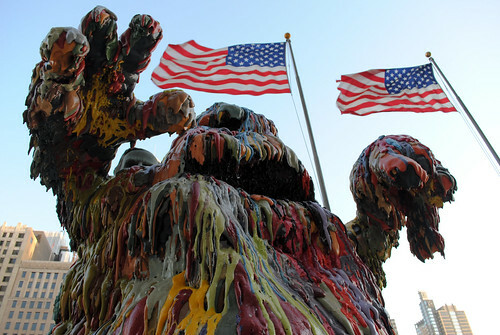 Chicago may be better known for NeoCon--that’s the design show, not right-wing political philosophy--but the contemporary and modern art equivalent, Artropolis, appears to be holding ground with another solid run at the Merchandise Mart over the last weekend. Artropolis, the Midwest‘s answer to Art Basel, is comprised of three fairs: Art Chicago; NEXT, an invitational exhibition of emerging art; and the International Antiques Fair. AN’s Midwest Eavesdrop took a spin around the preview party to peep who turned out for the free booze and what was showing at the fairs. Kavi Gupta and his namesake gallery were positioned front and center with work by a sampling of his artists, including Susan Giles’ contorted-architecture-as-sculptures and Tony Tasset. Both artists were included in the large-scale works displayed inside and out of the Mart’s first floor. Liz Nielsen, director of the Swimming Pool Project Space curated the Goffo section of NEXT, including an interesting architectural model of the International Space Station. Daniel Baird’s model depicts the Station rebuilt to scale on Earth and left to decay. Back at the bar, Eavesdrop spotted Justin Cooper, who is included in the current show Production Site at the Museum of Contemporary Art and David Csicsko the artist and designer who created the mosaics installed at the recently renovated Belmont L station. Was it performance art or hipster desperation? But the unexpected highlight of the evening was the distribution of leftover Dominoes pizza outside of the Mart at the end of the party. Free booze, drunken art students, and garbage bag pizza nicely juxtaposed with the well-heeled climbing into their limos. 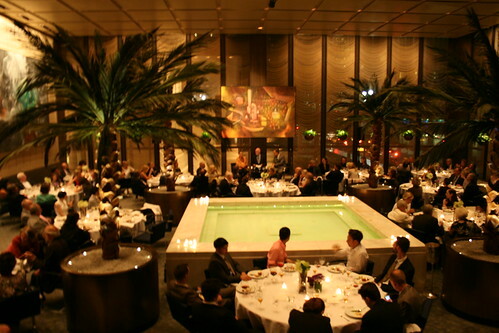 Wednesday night the Guggenheim held a benefit dinner to honor the fiftieth anniversaries of the Wright museum and of the Four Seasons restaurant. During dessert Guggenheim Director Richard Armstrong interviewed Phyllis Lambert and critic Martin Filler about the two architects, though Lambert held sway for most of the conversation. Lambert was delightfully off the cuff throughout her remarks. When asked about meeting Wright, Lambert, she replied that she and Philip Johnson thought Wright was “from another century,” apparently a reference to Johnson’s banishment of Wright to the hall outside the famed International Style show. She was complimentary about Wright’s building for the way in which it breaks up the street wall of Fifth Avenue, an urban transformation simultaneous with creation of the Seagram Plaza on Park Avenue. Filler cited the great metaphor-maker Vincent Scully’s characterization of the Wright building as a primitive drum in the heart of Manhattan, and praised the building for being as relevant today as it was when it opened fifty years ago. Talk of Mies and Johnson, however, dominated the conversation. At one point, Filler said that Johnson could be more Miesian than Mies, citing the Four Seasons interior as an example. Lambert disagreed, saying that the interior was all Johnson and that Mies would have created an entirely different restaurant had he been in charge. Lambert’s I-was-there certainty was difficult for Filler to refute. Also in attendance were Four Seasons restoration architect Belmont Freeman, Architectural Record’s woman about town Suzanne Stevens, Winka Dubbeldam, Michael Bell, Bernard Tschumi, Peter Eisenman and Cynthia Davidson, Michael Gabellini, Gisue Hariri, and Marion Weiss and Michael Manfredi. Saturday night’s Beaux Arts Ball was a smash! Hundreds of architectural enthusiasts and even the Dosa guy from Washington Square Park trekked to Brooklyn to attend the Architectural League’s annual benefit for their exhibition and lecture programs.Attracting the likes of well-known New York-based architects Calvin Tsao, Karen Fairbanks, and co-chair Andy Bernheimer, along with a slew of designers, critics, writers, like ourselves, and design aficionados, the event at The Old American Can Factory in Gowanus opened its doors for the architecture community to explore the building’s many studios and enjoy an open bar and good company. 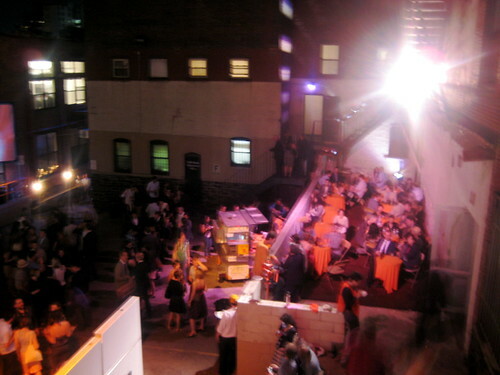 The ball took place in the courtyard and buildings of the factory, with studios of local artisans, fabricators, artists, designers, filmmakers, and publishers open for viewing and art making during the early hours of the night. We were pleasantly surprised to stumble upon the offices of both new and familiar faces, including Cassim Shepard, Project Director of UrbanOmnibus, John Mangin of Center for Urban Pedagogy, along with designer Lindsey Adleman of Lindsey Adleman Studio. Lasting late into the steamy Brooklyn night, the evening was filled with everything an architect could possibly need to pull an all-nighter, from music, provided by DJ Chris Annibell/Afrokinetic, and alcohol to late-night eats from street vendors. Who said architects don’t know how to party? 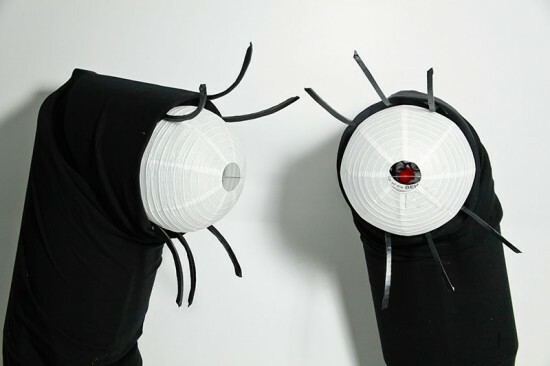 The Architectural League's Beaux Arts Ball 2009 this Saturday night has a dress code, but not the kind you might expect. “No stilettos please,” warns the invite, because in addition to the standard drinks and dancing, this ball features a vast factory where guests will be “building, binding, stitching and printing.” The night’s theme is MANUFACTURE, and the venue is Gowanus’ Old American Can Factory, a sprawling 19th-century complex recently repurposed as a working space for creative industries. Some of the artists-in-residence will be on hand inviting guests into their studios and demonstrating how to use the machinery. 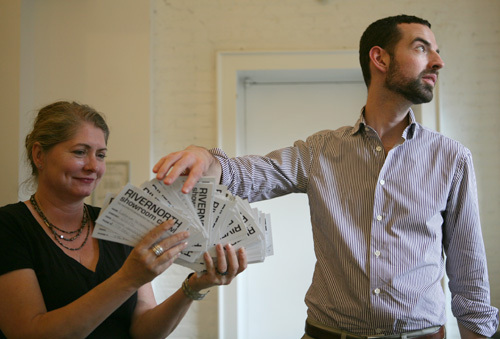 (“Free materials will be available; feel free to bring your own,” urges the invitation.) It may be hard to picture, but the Architectural League has a strong track record of pulling off art installation/ fancy-dress-ball mashups. 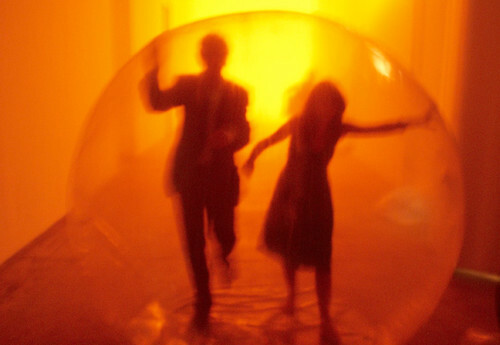 Last year’s Beaux Arts Ball boasted giant inflatable bubbles; 2007’s had a mylar lounge and a fog room. And if you’re not feeling industrious, you can always head over to the courtyard for food and drinks, with DJ Chris Annibell/Afrokinetic spinning and Wingspace Theatrical Design lighting the night. Beaux Arts Ball 2009: MANUFACTURE. Saturday, June 6 9:00 PM – 3:00 AM+ (Note: manufacturing space closes at midnight) The Old American Can Factory 232 Third Street at Third Avenue Gowanus, Brooklyn 11215 Tickets are still available, $25-250.